I know it sounds too easy or too good to be true, but every time I do what it takes to “Open My Abundance Door” it works! After years of not knowing how to open or close the door to manifesting abundance, I learned the difference that causes either one of these two results, and now it’s hard to deny the simplicity of the actions I need to take. So here’s the theory – every thought you think and every focus you choose leads you in one of two directions – towards abundance or away from abundance. Law of Attraction teachers tell us that our “abundance” or what we have been asking the Universe for is all “piled up” behind a big door – and our vibrations determine whether we swing that door open or shut. You are welcome to think or do anything you wish and focus on whatever you want, but I want to let you know that once I learned this process of opening the door, I could no longer focus on negativity and ignore that it was slowing down my manifestations. There are plenty of times that I still choose to notice what’s wrong or focus on negative thoughts, but not without acknowledging the Law of Attraction consequences in my life! When I learned how to Open My Abundance Door, I felt so empowered and no longer resented the apparent randomness of manifestations. When I learned how to Open My Abundance Door, I became acutely aware of how easy it was to slip into old patterns of negative thinking, and I made the decision to choose my thoughts. If you want to simplify the attraction process, it’s easy to boil it down to actions (thoughts) that Open or Close Your Abundance Door. This reduces a great deal of resistance as well. To Open Your Abundance Door, you need to choose thoughts and behaviors that raise your overall vibration. When you fret and worry and focus on negativity, the door tends to close a little bit more, keeping you away from the manifestations (health, love, peace of mind, opportunities, stuff…) you have been asking for in your life. Choosing to Open or Close Your Abundance Door is a moment to moment decision that I invite you to make in your life. Opening Your Abundance Door is one of those simple recipes; what you see is what you get. There’s no twist to this, it’s plane and simple – every thought you have and focus on leads you in one direction or the other. How do we open the door instead of closing the door? With simple action steps to raise our vibration. That’s it – some steps that we take close the door, others open it. Remember that our thoughts are real and carry energy and our vibration matters! When we are practicing raising our vibration the Law of Attraction will offer us more to feel good about, which raises our vibration more and Opens Our Abundance Door even more! Having such a simple task such as choosing to Open or Close Your Abundance Door lacks resistance, which means you will automatically become more congruent with the desires you have been asking for from Law of Attraction and your desires start to show up. Are you ready to do some clearing? Answer the following questions about wanting to Open Your Abundance Door. I have added the typical “yes, buts” that surface when I ask clients the following questions. 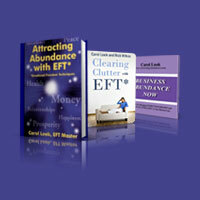 (1) What’s the “downside” to allowing yourself to Open Your Abundance Door? Yes, but, I’ve always believed life had to be hard. Yes, but, sometimes I prefer focusing on what doesn’t work in my life. These are powerful questions to help you uncover any resistance to allowing yourself to Open Your Abundance Door. Once you know the upside of staying where you are or the downside of getting what you want you can treat these “yes, buts” with simple EFT sequences, change your energy, and become completely congruent with a successful life. (1) When you learn how to Open Your Abundance Door, it will no longer be a mystery why your abundance does or does not show up for you. (3) When you learn how to Open Your Abundance Door you will release huge amounts of resistance which will allow you to attract more abundance into your life every day! As Law of Attraction teachers say — it’s all energy. The Law of Attraction sends you situations that have the same energy and vibration you are putting out… so when you are feeling relaxed and confident because you decided to Open Your Abundance Door, the Universe will bring you more opportunities that match this feeling on an energetic basis. learning how to Open Your Abundance Door Now! Chin: “I’m not sure how to Open My Abundance Door. Eyebrow: “What if I could attract abundance by Opening My Abundance Door? Thank You, Universe for showing me exactly how to Open My Abundance Door with ease and clarity! Thank You, Universe for allowing me to feel safe and secure as I learn how to consistently Open My Abundance Door. Thank You, Universe for inspiring me to Open the Door to ALL of My Abundance – I feel the vibrational shift and power already! Combine these messages with this week’s topic, Open the Door to Abundance and make a profound and positive shift in your daily attraction process!